Battle of the Bands returns this Wednesday to The Victoria in Dalston - grab a beer then come and find us behind the bookcase. Andy Ingamells is an experimental musician who develops unusual methods of composition that blur the line between composer and performer. He has dispersed brief instructions via the internet to be interpreted and performed in over 30 different countries during a single day, filled taxis with recorder players reading traffic lights as musical notation, and invented the game of violin cricket. RELEASE THE IMP is an improvising trio currently creating and performing text scores. They will be performing Gemma's Broken Harp, composed by Taylor Burton, Joe Thwaites and Eric Fabrizi. Simon McCorry is a cellist and composer experimenting with looping and processing to create an evolving bed of sound. He'll be performing his own composition Invocation II. David Zucchi is a Canadian saxophonist, specialising in contemporary music. He will be performing Choke by Anna Clyne, an English composer now resident in the USA, who has worked in both acoustic and electro-acoustic music. 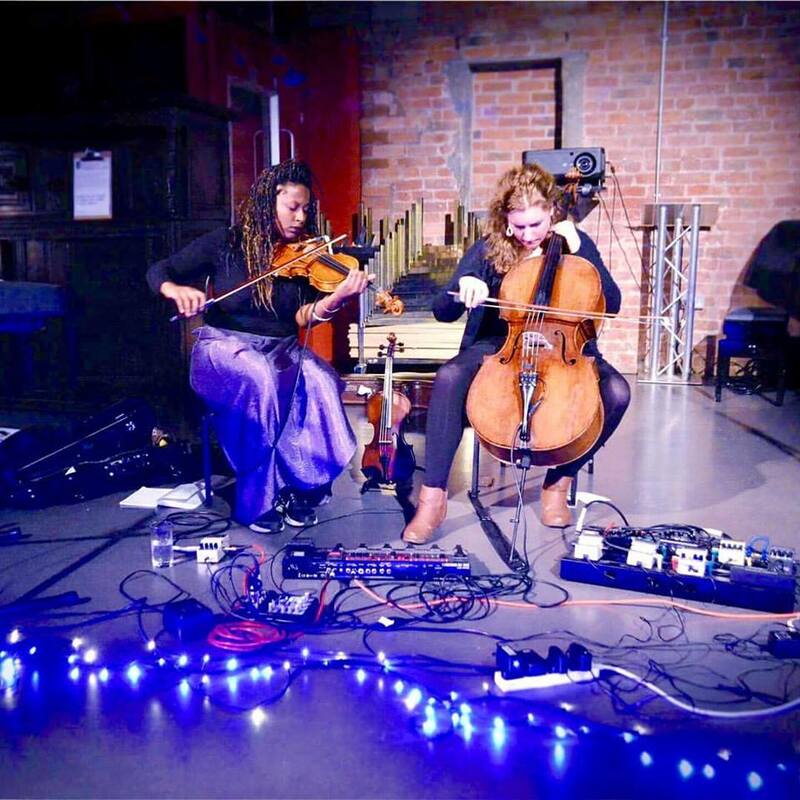 Täpp are a fresh, dynamic and versatile string loop pedal duo featuring Rebekah Reid on violin and Polly Virr on cello. The duo boasts a distinctive sound influenced by their love of classical/contemporary classical music, minimalism, electronic dance music, jazz, folk and world music. They will be performing Terry Riley's Sunrise of the Planetary Dream Collector, which was the which was the first piece Riley composed for the Kronos Quartet in 1980. The Improvisers' Choir aim to lift the practice of shaped vocal improvisation up into the light of widely appealing public performance. They are agile and imaginative vocal improvisers from a diverse range of vocal traditions - pop, metal, folk, cabaret, bel canto, world, experimental, contemporary classical and more. Composer-director Jenni Roditi conducts the choir using a system of signals that indicate the musical role of each artist, but not the musical content.